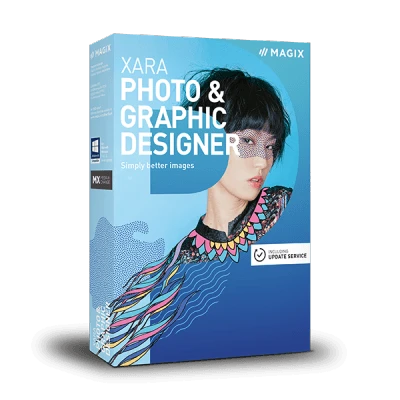 Download Xara Photo & Graphic Designer for free! Are you looking for a program for photo editing and graphic design? Download Xara Photo & Graphic Designer and test it for free. This complete program offers a wide selection of options for optimizing and creatively editing your photos as well as powerful tools for designing your own graphics. It's ideal for hobbyists, clubs, schools, students and professionals. Simply download and test Xara Photo & Graphic Designer for free. Test Xara Photo & Graphic Designer now for free and get the most out of your photos. Design unique photo and graphic creations or enhance your images. An amazing selection of professional filters and effects help you to make your ideas reality. And thanks to the "vector basis" your original photo files remain unchanged. Integrated realtime image editing makes ultra fast, lossless editing possible even for images with very high resolution. Give your images that final polish – download and test Xara Photo & Graphic Designer for free now! Optimize the brightness, contrast, image composition, color temperature or sharpness in record time. Perfect the quality of your images using the high-performance Level Correction Tool. Easily remove disruptive image areas with the Photo Heal Tool or Magic Erase 3.0. Create impressive collages and rearrange people on different backgrounds.